LOL, that’s a good point about the relative cleanliness of the characters. I suppose this isn’t the only Western you could say that about either! oh no, there are plenty! Over the years I’ve come to cut Campbell a bit of slack as LeBoeuf. I think the movie would have been better served had they cast an actor in the role instead of a singer. However, considering his lack of experience, he didn’t do too badly. In any case, the film is all Wayne’s and Darby’s and they are perfect. When I get too jaded about the Oscars I try to remember John Wayne’s heartfelt gratitude at his win. It may just be something in the trivia corner for fans to argue about to us, but to the actors it is something special. I agree with you about cutting Campbell some slack for not being an actor but the overall quality of the movie would have definitely been improved with a professional in the role. Thanks for reading. Must confess I haven’t watched this yet, despite owning it on DVD, but I aim to catch up with it very soon. Another good late performance of Wayne’s was in ‘Rio Lobo’, even if it was a bit like a remake of El Dorado and Rio Bravo! yeah, but I think in those movies you can still see too much of John Wayne and not enough of the character he’s playing. Thanks for your comment. Good point about how people were clean in these westerns! What about the breathtaking blue sky? I like this film very much, especially for its visual. 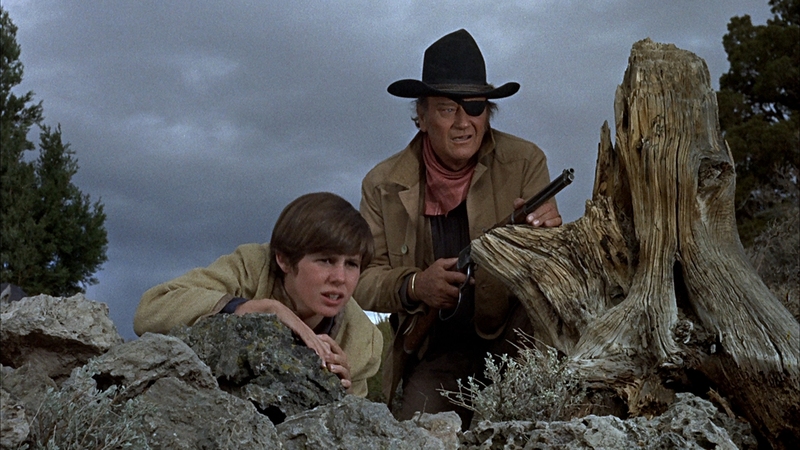 It’s frequently on TV here, and I find it amusing to see John Wayne with only one eye shooting people. And that talk about Rooster’s family is a surprisingly moving touch amid the action. yes, the scenery is pretty spectacular, one of the high points of the film, I should have mention it. Thanks for your comment, I’ll check out your post for sure. Want to hear something funny. The reason I have long-claimed to not like Westerns is because the men are usually scruffy, dirty, and unkempt. Plus, there is dust and tumbleweeds galore. At any rate, though I’ve only recently developed an appreciation for Westerns, “True Grit” is one I’ve liked since a child. We went to the drive-in to see it back when it came out. Of course, Glen Campbell was the draw for me, and I very quickly developed a mild crush on him. I think John Wayne was great in this role…very deserving of the Academy Award he earned. Hey Patti, it is kind of funny! Anyway Wayne’s Oscar was well deserved. True Grit is the Western of my childhood, I haven’t seen it for years. In fact, I’d totally forgotten about Denis Hopper’s role! This is one of my favourite John Wayne roles, but I couldn’t agree more with your point about its cleanliness – nothing ever feels particularly realistic and (despite what I mentioned) I find it difficult to relate to any of the characters – I cam never believe in them enough.